How do we give service? Like to be kept informed? Rotarians visiting to 'make up'. Photo Galleries How do we give service? Like to be kept informed? Information about Joining Rotarians visiting to 'make up'. 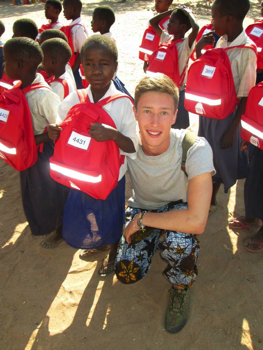 Luke spoke to us on Wednesday 3rd October about his favourite charity, the Piers Simon Appeal and School in a Bag. Simply click on this link https://zoom.us/j/3592264792 or use the meeting number 359 226 4792 on any web enabled device to join us. In November 2008 the Piers Simon Appeal (PSA) were invited to join the disaster relief charity ShelterBox in a joint project to send school equipment out to orphan children in Swaziland, Africa. The Piers Simon Appeal committed £50,000 towards the project. Orphan children were given ONE pencil a year by the Swaziland government. Children receive ONE meal a day at school (often their only meal each day) but without eating utensils they were unable to eat. The solution was to fill a rucksack with stationery and stainless steel eating utensils and in March 2009 the process of packing the 32,000 bags for children at 350 schools took place at the ShelterBox warehouse in Helston, Cornwall. The bags were shipped to Swaziland and distributed by NERCHA. In June 2009 Henry, Celia and Luke Simon visited Swaziland with four ShelterBox representatives to help with the distribution of the bags at four schools. The 5-day trip had a very strong impact emotionally on Henry, Celia and Luke. 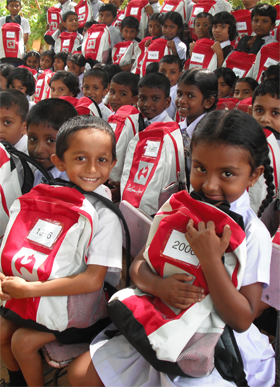 From the outset of forming the Piers Simon Appeal, helping children and enhancing education was always one of the charity objectives and these simple rucksacks filled with basic contents presented an opportunity to pursue the idea further. One week after their return Luke packed away his garden design office, transformed it into the Piers Simon Appeal and coined the phrase 'School in a Bag'. Through the fundraising of four local schools and PAS funds, the first 400 SchoolBags were sent to two orphanages in Sierra Leone. Instead of being boxed up these were sent as cargo in a minibus jointly funded by the PSA and Orphfund.
. In June 2009 Luke Simon and volunteer documentary photographer Jenny Hardy flew to Freetown to meet the van and distribute the SchoolBags. In June 2011 the board of the PSA unilaterally decided to make School in a Bag its own brand to give it its own identity and provide it with the capacity to grow beyond the catchment area of the PSA. This was taken from the School in a Bag website where you will find further extensive information about the project and have the opportunity to donate.